There is so much we can learn from each other that will make us better people- more understanding, more tolerant, more forgiving, more industrious, more knowledgeable, more loving, more compassionate, more peaceful, more patient. The list goes on. 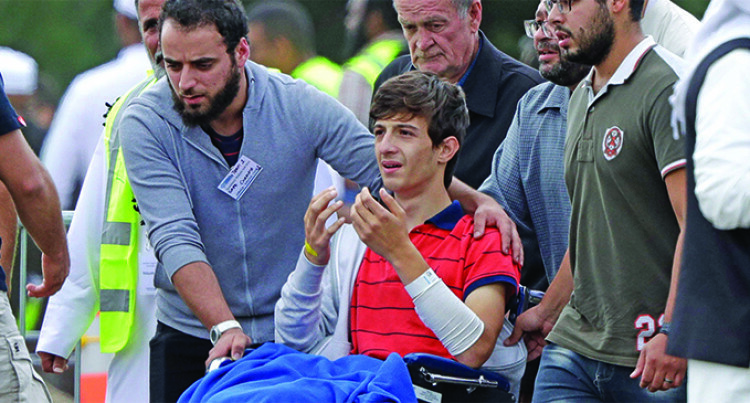 Zaed Mustafa, in wheelchair, brother of Hamza and son of Khalid Mustafa who were killed in the Friday, March 15 mosque shooting, during their burial at the Memorial Park Cemetery in Christchurch, on New Zealand, Wednesday, March 20, 2019. How much do we know about each other’s culture, ethnicity and religion? If the answer is very little or nothing at all then it’s time to do something about it. You will notice that these are all beautiful traits that will ease the burdens and pressures of life. Talking about being patient, the other day I was caught up in a traffic jam in Suva. The traffic had come to a stand- still. A taxi came from nowhere, zoomed past everyone and somehow in a miraculous way, managed to squeeze itself into the moving traffic further ahead. It was daring, but downright stupid because the driver could have caused a serious accident. Sadly, this was not the first I had seen this sort of foolish behaviour from taxi drivers. It was deplorable and insane. I am sure not all taxi drivers do these crazy acts because some of the taxis I have ridden before, the drivers were excellent. The drivers were courteous and professional. It was obvious they had done their defensive driving course. On Saturday I attended a birthday party. Me and my wife were the only non-indo Fijians there. The birthday girl is from a very loving Muslim family. The extended family members also attended. I later learned during the course of the evening as we mingled that one family with five children, their father is a Muslim and mother a Hindu. “That intermarriage happened some years ago and the offsprings are part of a happy, stable and strong family. I heard that there are several other cases which they do not openly talk about because of cultural sensitivities. But they know these cross-cultural and cross-religious intermarriages are happening at a faster rate than Fijians are aware of today. There will always be people who do not subscribe to this social change because they still hang on to their deep- seated cultural beliefs and values and are resistant to change. “But their numbers are dwindling as people motivated by love continue to break the barriers that divide us. The opening of doors to embrace our Muslim brothers and sisters in mourning after the Christchurch terror attack by other religions and ethnic groups is a wonderful gesture. Do we have to wait for an international or local tragedy to happen before we reach out to those with different backgrounds? We all need to be proactive to remove the barriers that segregate us. We need to start now. We must open our doors to other races, cultures and religions to know and understand them. “The racist overtones that sometimes dominate our political conversations and cause racial tension and division arise from a general lack of knowledge and understanding of other cultures, ethnicities and religions. We need to bridge this gap. The recent attacks against the Chinese community revealed how those responsible were ignorant of what they were talking about. They jumped on the bandwagon of hatred and bitterness based on false propaganda by certain politicians to attack and vilify an ethnic group. All of us must know that we are all equal in the eyes of God and he loves each and everyone of us because he created us in his image so that we can be like him in body and soul. to overcome the challenges of life and fulfill his great purpose that after we die we will go back and live with him for time and all eternity. “That is the plan. How we execute it is up to us. If we make the right decisions we will succeed. One of the fundamental truths is that our birth into a family is like an assignment- our assignment. We are born into families of varying circumstances. Some are born into rich families, others into poor families. “What is important is how we develop our potential and use the opportunities that come our way to grow and help others to develop and grow too. Learn to be nice to everyone. It will help to break the wall that harbours suspicion and mistrust. Let’s welcome others who may speak a different language, com from a different faith and value system, and look different to us. Remember that we are all equal as brothers and sisters in God’s family. It’s our individual choice that we belong to different religions and political groups. It’s our also our own individual choice to uphold certain political ideologies. “Those ideologies may not be in harmony with God’s standards. God will hold us accountable. It is a time of serious soul searching and resetting of our moral compass. Let’s start by removing those inhibitions that prevent us from opening our hearts not only to Muslims, but also Hindus, Christians and other faiths including atheists.